Shark week wedding! This tattooed couple's wedding was featured on Offbeat Bride. This surreal image is actually...real! 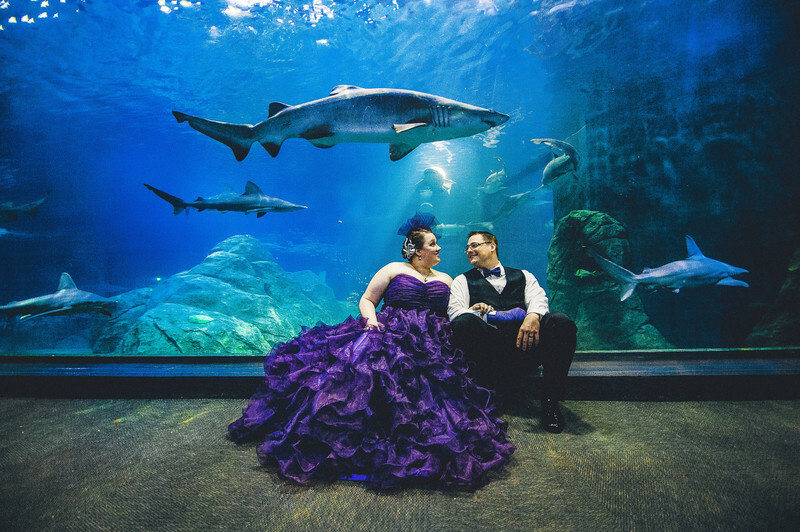 The shark is swimming behind the wedding couple at their Aquarium wedding. The Adventure Aquarium, formerly the New Jersey State Aquarium, is a for-profit educational entertainment attraction operated in Camden, New Jersey on the Delaware River Camden Waterfront by the Herschend Family Entertainment Corporation. Wikipedia Address: 1 Riverside Dr, Camden, NJ 08103 Opened: February 29, 1992 Phone: (856) 365-3300 Exhibits: Shark Realm, Penguin Island, Irazu Falls 1 Riverside Dr, Camden, NJ 08103 Book us for your Adventure Aquarium wedding today! Location: 1 Riverside Dr, Camden, NJ 08103.